Aval Sakkarai pongal is one of the easiest and quickest pongal recipe. As Pongal festival is nearing, I wanted to share this easy and delicious pongal prepared with poha/aval, jaggery and lentils. It tastes heavenly when served hot. Today we will learn how to make aval sakkarai pongal following this easy recipe with step wise pictures. Dry roast moong dal until you get a nice aroma of roasted dal. Cook with little water until soft. Mash it well and keep it aside. You can also pressure cook dal for 2-3 whistles. Rinse aval/poha 2-3 times, drain the water completely and let is sit for 15 minutes. If using thick aval, sprinkle little water and let it sit for 20-25 minutes. Make sure the aval is soft by tasting it. Fry cashew nuts until golden brown and keep it aside. Fry raisins until it puffs up and keep it aside. Melt jaggery in 2-3 tbsp of water, filter it to remove any impurities. 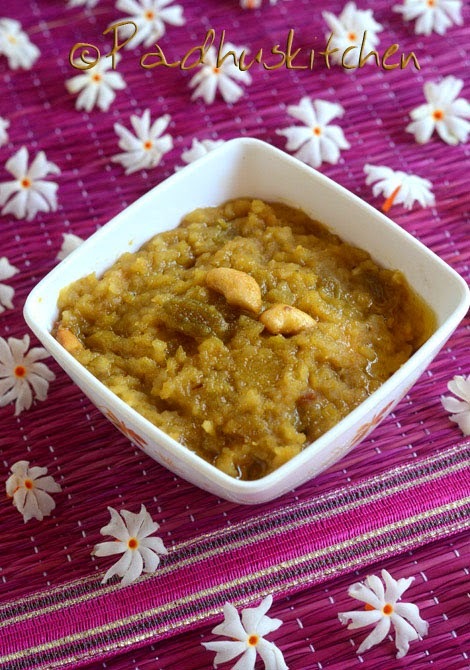 Boil jaggery with 1/2 tsp of ghee, when it starts boiling, add the cooked and mashed dal. Let it cook on medium flame until it slightly thickens. Fluff the aval with a fork and add it to the jaggery+dal mixture. Once it thickens slightly, add milk (milk is added to prevent dryness) and cook for a further 2-3 minutes. Add cashew nuts, raisins, cardamom powder, remaining ghee, mix well and remove from heat. This pongal tends to thicken as it cools, so remove from heat when it is semi thick in consistency. Serve this healthy and delicious pongal hot drizzled with a little ghee if necessary. Will this Aval pongal tastes good if using red aval ?? I tried with both aval. Though this pongal with red aval was not bad, white aval taste better than red ones. I am going to try it for regular pongal, as we all love rava pongal..this will be even faster :) thanks for the idea!! It tastes really delicious padhu. thank you for variation!! Awesome. Very clear directions. Only thing is Cooking time is much more than 10 minutes.